Here are the latest predictions on Netanyahu’s speech tomorrow to the U.N. General Assembly from intrepid Mondoweiss readers. For more predictions see here and here. And don’t forget to send yours in today! There are no words in Hebrew for war or hatred or nuclear weapons. Sadly, in Farsi, there are no words for peace, love and children. Contrary to the Iranians – we have no way of expressing concepts such as wipe or map or even pages and time. Ours is a language of hugs and cuddles, puppy dogs and hot apple pie with vanilla ice cream. If you allow Iran to attain nuclear capability, the whole world will need to learn Farsi in order to truly grasp the depths of their depravation. I ask you, no, I beg you, please don’t let that happen. For the sake of the kitty-cats, the little babies, soft lighting, Barry Manilow and all the things we hold dear – and they can’t even pronounce – stop that bomb. Send your entry to [email protected], thanks! Thank you Adam. These are way too good not to share. shmuel is priceless. and i love hostage’s men in black. this is so much fun. HaHaHa!….they are all hysterically funny…thanks for the laughs. Incredibly clever and funny folks here @ Mondoweiss. Yeah sure– an Iranian/Belgian “spy”. And the thought of Netanyahu telling the truth is hysterical. Why does this remind of Nixon’s “I am not a crook” statement? Paul Normandia’s evidence looks really convincing. Iran is very cunning. Also, Shmuel is so funny. Mocking aside, this is serious, God knows what this man will do to get a war on Iran and a weak president like obama isnt comforting. Remember what I said about not getting too excited about the Arab Spring? I told you so, even when you criticized me for not joining your superpositivity club. I’m not expecting a thank you for my prescience; I’m well aware of the inverse correlation in the UNGA between being right and being popular. Those of you who actually invested in this new democratic Egypt you waxed poetic about (and ha, ha, it turned out to be very few of you) got your own comeuppance. It turns out that you thought pretty much what I thought about the Arab Spring. Oh well. What I said about the Arab Spring goes for Iran. And please, people, cut the crap. Just because we’re skeptical about diplomacy with Iran doesn’t mean we’re against it. Try and understand, which I’m sure you can: When a country’s foreign policy toward you consists of shouting Death to Israel at public rallies, you tend to grow suspicious of their intentions. Who knows; maybe Hassan Rouhani will turn out to be the Iranian version of Pope Francis. The Iranians are absolute masters at lowering expectations. I mean, the last guy they had denied the Holocaust, and now, the world is applauding because this guy admitted it happened. He apparently had a severe case of “being a human being” because the words were barely out of his mouth before the authorities in Iran tried to spin them. Just as years of losing members created a more humanistic Pope in the Catholic Church, maybe years of economic sanctions created a more pleasing Ayatollah puppet. Sorry, I mean Iranian President. No need to remember? No need we look up what his thoughts were in ‘A Place Among the Nations,’ (1993) his argument was the main obstacle to peace in the Middle East was the Jewish state’s lack of democratic neighbors. He said any party wishing to promote Western style peace in the area has to move toward democracy. Of course he changed his tune when it started to become a reality, showing the duplicitous nature of a man who cannot be trusted by his word. Adam, I think you meant “ears” not “fears” in the title. lol! i doubt it eva. adam’s humor is at times twisted/cryptic. Annie’s right. Its a wordplay on Netanyahu’s fear-mongering. It is not in a superpower’s interest to get sucked into projects of someone with a King David complex. . .
. . . If it [the U.S.] does not escape a war, it will be hard to find any silver lining in the consequences. But perhaps one would be that Americans would then be more likely to understand how contrary to their own interests it has been to follow the preferences of the Israeli government. Perhaps that could be a first step toward a more normal — and more beneficial for the United States — U.S. relationship with Israel. . .
Iran’s nuclear programs are turning it into an existential danger to the State of Israel. The question is not just what Israel is doing to stop it, but what the world is doing. The awareness by the world community that Iran is progressing on a track toward developing a nuclear weapon obligates it to act so that Iran does not get this weapon. With every day that passes, Iran gets closer. The obligation of the international community to act grows as the fear [that Iran progresses toward a bomb] does. You must keep in mind: that we aspire toward peace; but at the same time we must wield the sword of David to defend the Jewish State. Of course, in Bibi’s skewed world-view, David’s sword was raised only to defend his people, not in aggression against a victim. But we should keep in mind that David’s sword slew an Israelite enemy and led to the killer’s annointment as King of Israel. . .
. . . Bibi (and to a lesser extent, Barak) have a very complicated complex that is little short of messianic and frightening. In the past, I’ve written dismissively about Bibi saying he has no principles and that even his so-called Jewish values appear to be manufactured. Now, I’m not so sure. And I don’t know which is worse, a megalomaniac with no principles or values; or a Jewish megalomaniac with religious-nationalist principles and values. They both scare the living hell out of me. . .
• AND NOTE: Apparently Perle, Feith, the Wurmsers, etc. were aware of Netanyahu’s ‘King David’ Complex because they referred to “Securing the Realm” in the title of the 1996 manifesto (“A Clean Break: A New Strategy for Securing the Realm!”) that they prepared for Netanyahu! [EXCERPTS] A delusion is a belief held with strong conviction despite superior evidence to the contrary. Unlike hallucinations, delusions are always pathological (the result of an illness or illness process). As a pathology, it is distinct from a belief based on false or incomplete information, confabulation, dogma, illusion, or other effects of perception. . .
Grandiose delusions are distinct from grandiosity, in that the sufferer does not have insight into his loss of touch with reality. An individual is convinced he has special powers, talents, or abilities. Sometimes, the individual may actually believe they are a famous person or character (for example, Napoleon). . .
. . . Grandiose delusions are characterized by fantastical beliefs that one is famous, omnipotent, or otherwise very powerful. The delusions are generally fantastic, often with a supernatural, science-fictional, or religious bent. . .
** P.S. That’s why I sometimes (only half-jokingly) refer to “The Dissociative State of Israel”! The hilarity of this is that it’s much closer to what an Iranian or an Arab leader might say than what a Jewish leader may say. They’re the ones who are prone to the conspiracy theories. Now THAT was a conspiracy theory! C’mon, hophmi. The best you can come up with is “I’m rubber, you’re glue”? By the way, Netanyahu is an Israeli leader, elected by the citizens of Israel. Shmuel, that is priceless. As absurd as it is, every sentiment is only slightly exaggerated from actual past statements. The other entries are excellent as well. The only safe prediction is that no matter how outlandish his presentation, mainstream news media will show proper respect. “Israeli Prime Minister Benjamin Netanyahu on Monday warned President Obama not to be fooled by overtures from Iran that have led the administration to pursue talks aimed at halting the country’s nuclear weapons ambitions. “Israeli officials also suggested that Netanyahu might present new evidence of Iran’s nuclear program at the United Nations. A surprise like his last one????? ROTFLMAO. Send all these to The Onion, so the Chinese will re-publish them as true! i think bibi will be a disappointment at UN as far as cartoon placards goes. he going to have to show some rational to comspensate for Rouhani charm. in turn this could be the end of his political career as the other hardliners will see this as an weakness. dog eat dog and all that. If Netanyahu succeeds in procuring President Barack Obama to risk the lives of American servicemen by attacking a non- nuclear Iran for the convenience of the Israeli nuclear state, will future American electorates ever again put a black Democrat in the White House, at least for the next hundred years, if this president subsumes the national interest of the Union and bows to the military and political will of an expansionist Mediterranean state? 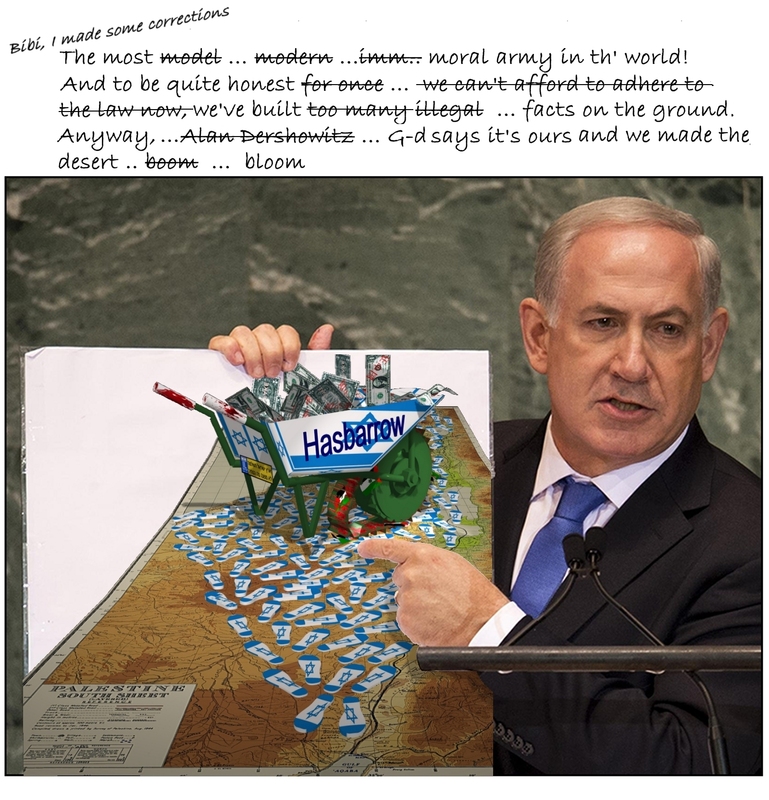 After all of you satisfy your instinctive love to our dear Bibi Netanyahu of whom I (unlike many of you) is not a big fan one must admit that Israel in general and Netanyahu in particular seems to be winning this anti-Iranian campaign in which he managed to convince the West world to follow by unprecedented sanctions. So – sanctions are working, Bibi and Israel are winning!! Never mind his cheep tricks with diagrams – he has been successful so far. If you are right and Iran is sincere on giving up its intentions then the sanctions are working and forcing them to stay away from the bomb. If as some claim Iran never had such intentions – all the better. What Bibi seems to do is the only correct think in this situation – keep the pressure up, let the observers in to verify that they are sincere, make sure that this process reaches the end we wanted to. And another remark – if King David complex is correct then all the claims that Natanyahu is sincere in leading this campaign and not as a trick to divert world attention from I/P conflict. if King David complex is correct then all the claims that Natanyahu is sincere in leading this campaign and not as a trick to divert world attention from I/P conflict. uh huh. and if rouhani is like hitler then all the claims that Natanyahu is sincere in leading this campaign and not as a trick to divert world attention from I/P conflict. and if a equals b then a and b are the same. but if a equals 1 and b equals 2 then they are not the same. this is a logic 101 lesson.